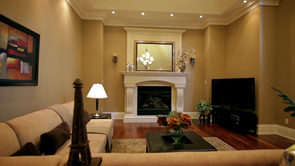 Interior Decorator Lisa Reis gives some helpful tips on how to decorate your living room. Look for the focal points of the room and make sure that they are uncluttered and featured at their best. Consider pulling the furniture into the room if it is large instead of up against the wall. Look at the colours and choose a colour palette that is warm and inviting. Creating small vignettes throughout a large living room, such as a small reading nook, can prevent a spacious living room from feeling empty. By following these simple tricks, you can create a beautiful living room that your family will enjoy! For more decor videos by Lisa Reis stay tuned to lifestylevideos.com.